Norway. Not the first place you might guess for providing the spiritual origins of a whisky hand-crafted in southern Tasmania. Yet it was in the home of the Vikings that inspiration first struck the hero of this tale. Casey Overeem was introduced to the art of distilling in the early 1980’s while visiting relatives in Norway who happened to have a still in their cellar. Impressed by what he saw, Casey was driven to experiment back in Tasmania over the following years, culminating in the founding of Old Hobart Distillery in 2005. Casey’s main partner in crime at Old Hobart Distillery is his daughter Jane, who has become a well-known face in the Tasmanian whisky scene and an inspirational figure for women in a largely male dominated industry. Together with their crew they fuse fine Tasmanian ingredients together with their passion for the art to create the eponymous Overeem whisky. Old Hobart Distillery cuts down its barrels (in this case French oak sherry barrels) to create quarter casks, which allows their spirit to develop far more character over a short timeframe. Once the distillers are satisfied with the level of maturation (min. four years) single barrels are selected for bottling, meaning that each release is unique. The Overeem Sherry Cask sampled for this review comes from barrel OHD-067. The view in the beautifully shaped bottle is pleasing, with the 43% spirit glowing a bright syrupy ginger in colour. The nose is rich and relatively intense, oozing with delicious sun dried raisins, vanilla, mixed peel and candied ginger. The tastebuds are engaged by a sensation of mulled wine, like hot oranges and shiraz, followed by a faint tang of bitterness and burnt sugar. The spirit is dry and very smooth, and the flavours are level and constant throughout the experience. 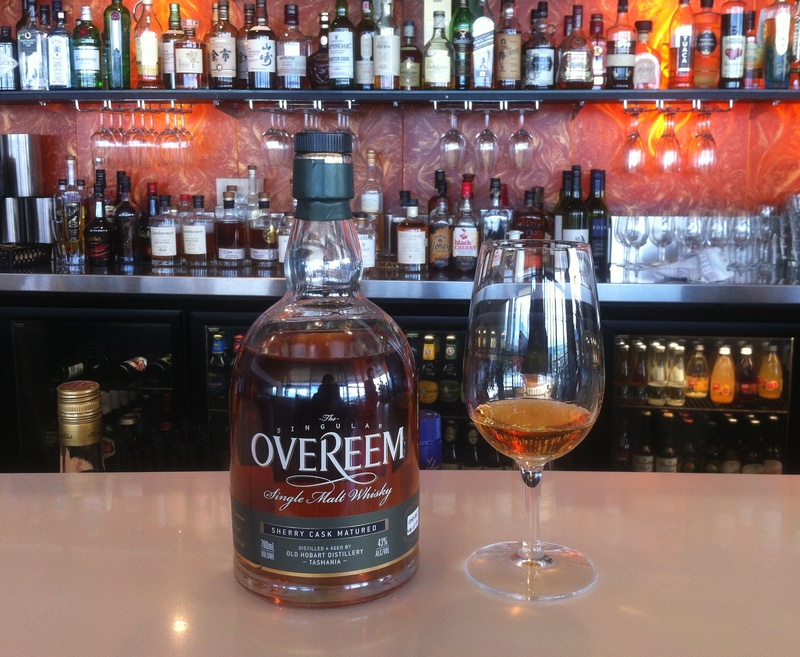 The Overeem Sherry Cask is a triumph of the exciting new whiskies making their way out of Tasmania, one that is well worth jumping into your longship and questing across the windswept oceans to find. Come to think of it, Casey Overeem’s own journeys in Norway seem to have added a certain something to his dram, as it is no great stretch to imagine mighty Viking warriors feasting in their long halls and supping on rich, warming Overeem to keep away the chill of a cold northern winter. Skål! OK you two. I understand that you are a bit biased in favour of Tassie. But will it ever really overshadow Scotland? There should be a law saying ‘no one can be better than Scotland.’ Even if it is true. My Gaelic heart would break. Hehe, well yeah, we kinda are 🙂 (and admittedly we are on a bit of a mission to sample everything on offer around home). But credit has got to go where credit’s due, there’s some pretty amazing stuff coming out of our little island. And really, they’re kinda different drinks. You’ve got Scotch, and you’ve got bourbon, and then you’ve got… something else. Hmm, someone really needs to come up with a catchy word for that. Cos that’s what Tassie stuff (and Japanese, and all the other funky new world stuff) is. It’s got its own vibe. So yeah, I agree, Scotch will always be totally amazing (and I am inclined to agree that tears will be shed if Scotch ever goes on the slide), but I think that other drams from around the world complement it rather than compete with it. That’s what’s great about whisky, it’s so diverse, and there’s so many exciting things to try.